In a partnership with MTV Scratch, Chevrolet looked into what Millennials looked for in a car. Ultimately what they found was that Millennials were not as interested in cars as they were in their cellphones. They send 60+ texts a day, are 6x less likely to have a driver’s license and think of the car more as utilitarian than a sense of personal style, deferring to their online personas as their personal style. 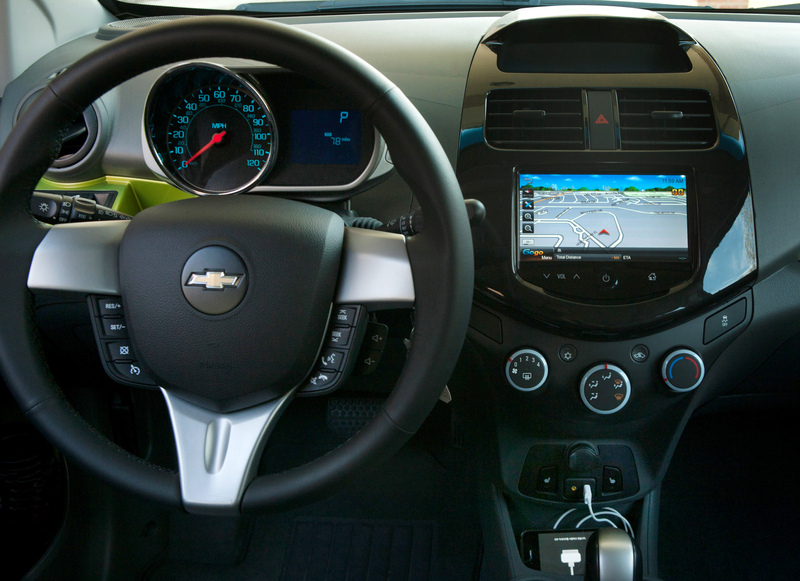 The Chevy Sonic and Spark will have usb and audio in ports to allow cellphones to work with the radio. In addition being able to play music off the iPhone/iPod/Android, which the Sonic I took to a Sonic Drive-In was able to do, there is now more integration. In addition to reading music off them, there are now apps that work with the phone. There were three apps shown – Pandora Radio, Stitcher Radio, and GoGoLink Navigation. While Pandora and Stitcher are user controlled streaming radio stations, GoGoLink is an interesting concept. After purchasing the GoGoLink to the smartphone for a one time fee, the app and maps are downloaded into the phone. When connected to the car and executed on the screen, the car’s GPS works off of the phone, loading all maps and taking all GPS data directly from the phone. Rather than having to pay an additional cost for a GPS or buying an external GPS, it seems like a good idea. My biggest issue with this system is my inability to get directions and talk on the phone at the same time. At times, I talk on the phone (with a hands-free device) while driving, but since I am on Verizon, I cannot get data and talk at the same time. Does this mean I cannot use the GPS on long drives if I don’t already know how to get to my destination? The rest of the MyLink radio is bright and easy to read. 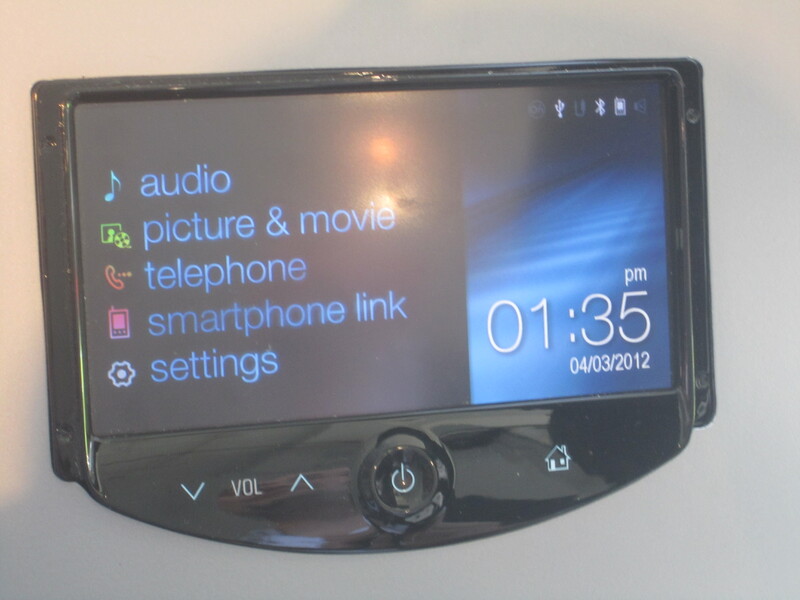 Menu navigation is kept simple and the text is large enough to read at a glance while driving to play music or make a phone call using the radio to the connected phone. When the car is in park, it can even play videos or show pictures that are stored on a phone. The one issue I had with the previous iteration, which I was unable to check on MyLink, was whether they had improved music selection on the phone or whether it was still a chore to select music that was at the end of the alphabet with a large music library. Overall, the radio is a definite improvement over the previous version of the radio that was in the Chevy Sonic. I like the further integration of smartphone and automobile and look forward to seeing where car manufacturers take it in the future. Perhaps our cars will one day be completely controlled by our phones.